Cheap flights from Dublin to India from €337 return! Cheap flights from Amsterdam to Phuket, Thailand from €352 return! Star Alliance carriers Lufthansa and Swiss or SkyTeam partners Air France-KLM offer competitive solution from Ireland to India. The cheapest solution is from Dublin to Mumbai..return flights avalable form €337 also adding solution to New Delhi from €383. In both cases you this is including all taxes, onboard meals and checked luggage. Good availability throughout whole year 2019 except usual blackout periods around Easter, Summer or Chirstmas Holidays. Discounted deals from Ireland on this route are not so common as on other European markets so do not miss this promotion if you have been looking for some good solution on these routes.. Both sales are available from March to June or September to December 2019 and in January 2020. Further details vary by each carrier and route. Book your hotel room in New Delhi or Mumbai through Booking.com or Hotels.com. Travel dates. : The easiest way is to compare directly with SkyTeam Air France / KLM or Star Alliance Lufthansa / Swiss. Alternativelly you can use Google Flights as it offers you almost instant result and you can easily browse throughout all the months. 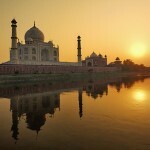 Booking sample of cheap flights from Dublin to India from €337 return! In this case you would depart from Ireland to Mumbai via Paris on 7th of October. Return from India back to Dublin on 14th of October 2019.